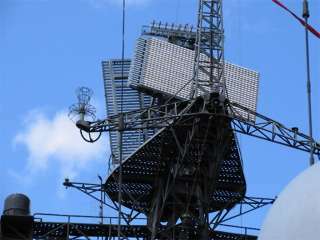 The MR-710 “Top Plate” «Fregat» («Фрегат») (meaning frigatebird) is an operating in D and E-Band air and surface surveillance radar for maritime use. It is a three-dimensional system which employs back-to-back antennas whose opposite antennas are optimized for two different frequency bands, which is why one antenna appears slightly smaller. The antennas are serially fed frequency scanning phased-array antennas. Since the frequency-dependent beam swiveling also affects the horizontal antenna rows, the resulting antenna beam swivels from bottom right to top left: i.e. diagonally. In order to compensate for this, the entire antenna face was rotated until the beam swiveling appears vertical again.